Welcome to RGC! Our goal is to be a premier source for Christian parenting and marriage materials that you’ll want to check back with every week. Be sure to check out the Raising Godly Children home site for brand-new articles by our top-notch group of contributors! Susannah Wesley was the mother of 19 children, including John and Charles Wesley. Through much adversity, she dedicated her life to instilling a sense of Christian Destiny into each of her children. Her children went on to change the world. Here are 16 rules she laid down in her home. 1. Eating between meals not allowed. 2. As children they are to be in bed by 8 p.m.
3. They are required to take medicine without complaining. 4. Subdue self- will in a child, and those working together with God to save the child’s soul. 5. To teach a child to pray as soon as he can speak. 6. Require all to be still during Family Worship. 7. Give them nothing that they cry for, and only that when asked for politely. 8. To prevent lying, punish no fault which is first confessed and repented of. 9. Never allow a sinful act to go unpunished. 10. Never punish a child twice for a single offense. 11. Comment and reward good behavior. 12. Any attempt to please, even if poorly performed, should be commended. 13. Preserve property rights, even in smallest matters. 14. Strictly observe all promises. 15. Require no daughter to work before she can read well. 16. Teach children to fear the rod. Susannah Wesley believed that for a child to grow into a self-disciplined adult, he/she must first be a parent-disciplined child. To her, the stubborn flesh was the hardest battle for Christians to fight, and Godly parents would do well to equip their children to overcome it early. brought to revere and stand in awe of the parents, then a great many childish follies may be passed by. I insist on the conquering of the will of children betimes, because this is the only strong and rational foundation of a religious education when this is thoroughly done, then a child is capable of being governed by reason and piety. Tricia, thanks for further explaining the context of that rule. I learned from it. Im not poor we have many servants dishwasher washing machine running water and abundance of food but my children are not able to reach in my refrigerator and eat willy nilly it is a matter of respect while they live here this remains my home their residence in it is temporary they must learn to respect other peoples homes including their parents residence. We will do the same when they aquire their own home. i love your contribution, it really brings the balance to that point. I respect her rules and reasons but I do not agree with it in my household. It’s never been a problem. Actually when my children were little I had them ask me so I could help them and avoid messes. But now that they are older I let them have some autonomy with this. I also have had some young men, friends children at our home a lot. These boys are very active and pure muscle not an ounce of fat. They must have incredible metabolisms. They can really put away the food! My opinion is that this is a time of growing and health building for young people and as much as possible we should let them eat what their bodies require of nutritious foods. Now if you have a child who is inactive and has a weight problem and tends toward junk that is a different issue. If you are poor possibly also. But children who are lean and high metabolism and growing I think it unwise to be restrictive with food. The boys I refered to actually had some developmental delays as they were adopted from the Ukraine and while lean and high metabolism they were small for their age. Their parents would chastise them for packing away a lot of food which I felt appalled at. It wasn’t cause they couldn’t afford it either. During the day there are good choices of food to eat and my kids are responsible for themselves and I don’t micromanage them. At night we eat dinner together. We don’t force that anyone eat. Only that we all come together at the table and stay until dad excuses. My family is a homeschooling family. My kids are almost grown. One thing I will warn you about is that a large percent of the kids of other homeschooling families I know who were raised in very regulated homes run like tight ships are rebelling and walking away. They are so keen on their systems to create perfect children that they end up becoming controlling and provoking their children to throw off the tyranny. I’ve observed that so few know a mountain from a molehill and will destroy their relationship with their children for things that just don’t matter that much in the scheme of things. They think that the name of the game is to make children even nearing adulthood to adhere to all their beliefs and plans for their lives and have no will but their will. In a lot this seriously backfires because children are wired to gain autonomy. If they are ever to make it on their own they need that. If your relationship is good older children can be influenced but many have ruined their relationship by that point. They continue to try to control and it doesn’t work. If you start the biblically inspired discipline on your children at their very tender age, they will never rebel. Also you need the leading of the Holy Spirit to know how to inculcate discipline in children of different character traits. God’s word counsels that parents should instil discipline on their wards strictly; compromising this is what has led to the serious moral decay of our time. In view of treating and seeing our children as God sees and views us, as His children, our home is where He is. To call your home YOUR home and not theirs is boarding school stuff. Their home should be your home and be with you, and wherever you are as their parents. My heart and stomach hates religion and love conquers all, not the religious demands of respect as human nature thinks it should be. Awesomely put, I totally agree. John Wesley’s autobiography is where this comes from. It is a letter she wrote to John, when he asked her about the subject of raising children, before she died. In it she talks about how all the servants in the house followed the same rules. I do not think a family that had “servants” plural was poor. She says nothing about being poor in the part about eating between meals, nor anywhere in the entire letter, nor does John say such a thing anywhere in his autobiography. You can read it yourself in his journal here, Pages 62 and 63. She was teaching her children about self-control and balance. She devoted great time and energy in bringing up her children, and as I understand was writing a book on child-rearing the manuscript which was lost in the house fire they had. My dad was such a scholar of John Wesley he had much of his works memorized and talked of those to us. Well, John Wesley has proved the effectiveness of these rules. I think that context isn’t the matter here. The effectiveness of the rules to our children is what matters most. You can feed your child as much as you wish, how does that affect their morals is another issue. May I ask what book it is? I believe the Rod as scripture says should be more of spiritual rod (raising the child in the fear of God) than physical rod. Physical rod may sometimes be necessary and not only teaching them to fear God. However, this should not be done too often so that the goal of instilling discipline will not be lost as the child may feel ill-treated. I’m sure the rod is physical with a word of caution. Do not punish when angry. Calm down. Some people explain to the child why they are being punished, thereby (hopefully) avoiding future bad behavior . When king David speaks of the rod. He speaks of His experience as a shepperd. But When the Bible speaks about parents not sparing the rod. God is not speaking about spiritual rod, The spiritual rod doesn’t have an example if you don’t use the one. I think the rod is physical but should be spiritually applied. The child will not die physically too. But his soul shall be saved. We need God’s wisdom. The heart aches from sweet children today raises this question, how were these brought up. Child soldiers, radicalised terrorists???. A man was being executed but his last wish was to talk to his mother. He bit off her ear saying you did not reach me…… .Friends we must keep learning but don’t give up. The next generation is worst than the last trending. Christ will ask me for any lost child. I appewciate the life time of susanna,i sincerely pray to raise both my biological and spiritual childrwn in ways that will always be pleasing to God. This makes no sense. There is no connection between the biblical use of the rod and domestic violence. Your argument pressuposes humans are not rational beings. Susanna, left a good legacy for christians, and for christian mothers in general. She will constitute a yard stick of judgement to every christian mothers. I subscribe to her principles of raising Godly children but rule number 4 goes contrary to her own disposition as she had self-will which she executed at age, 13 by leaving her father’s church and going back to Anglican, against her father’s wish. Also, breaking of selfwill in children made many of such to grow into adults who were unable to use their initiative. I would rather that the selfwill be controlled rather than broken. I discovered as parent that some of the principles of parents were as a result of the mistakes committed in their childhood. She herself must have discovered that she was self willed as a child and noted the consequences thereof that is why she made it a principle. susanna is a great role model for present day christian mothers.Her way of upbringing children has to be imitated by everyone who wants their children christlike. just an insert. We can raise kids and hold them to a godly standard, but raising godly kids is not within our power. People who tend to think “If I… then they will…” are often brokenhearted when it doesn’t “work.” Susannah Wesley is famous for her godly children. But she also had a daughter who had a child out of wedlock, none of her daughters married godly men, and every one of them who married was unhappy. Not every child was as firm in the faith as she was. But because she raised John and Charles and because they credit the way they were raised and because she was an authentic, unapologetic, uncompromising Christian throughout, people tend to think “if I do what she did, I’ll produce a John or Charles Wesley for the Lord.” And perhaps, by the grace of God, they will. But she held to her standards as she understood God giving them to her. She was faithful to what she believed and did not compromise in her home. A godly woman, yes. But let us not make her into an idol. Her rules are not Scripture. She is an encouragement and an example. Her thought of teaching children to govern their flesh from a very young age is Scriptural. But we trust in God to do the heart work. Kids do not come to us perfect and we break them. They came broken and are being raised by broken parents. It is our job to yield our reputation (who doesn’t want the reputation of a Susannah Wesley! ), to be faithful to God’s leading, and allow Him to do what He wants to do in our children’s lives. He is the Potter, they are the clay. They/We are not cookie dough and He does not use cookie chtters. I totally agree with your resume here. We should always take things like this in their proper context. Susanna’s rules were her rules, led by her spiritual convictions, but yes, we do not raise cookie cutter kids….cookies break too. Well said. Well said…thanks for the reminder and encouraging words. I do greatly admire Susannah Wesley and her maternal accomplishments are all to the glory of God. With that said, her bio is very, very intimidating to me. As a mom of 7, I have often thought: ‘If she did that with 19, I should be able to get it together with 7!’ I am learning that my children are not projects or potentially future bragging rights but little people who need to see Jesus in me-daily. (That only comes about through the Christian disciplines of daily Bible study and prayer. Lots of the latter! ) 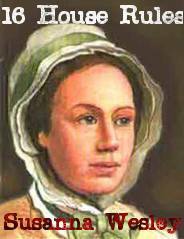 I have been trying to quit comparing myself to the super-Christian moms like Susanna Wesley!! (And mrs Duggar!) Your comment was what I needed this morning. I say amen and agree we are all born sinners and just by Gods mercy and grace thru faith can we be saved. Thank you so much for this perspective. Her daughters are not spoken of often, even in seminaries. God bless u, ur insert so balances out everything. man does the discipline and God does the rest in transforming the child.Am sure she didn’t just kept the rules in training up the children but backed it up with fervent prayer for each of the children as she spent time for each. Discipline & love goes hand & hand. Of course we shouldnt lose sight of d fact dat her rules were backd up wit prayer 4 evry child. Prayer is the key to every posibility. no central heat or A/C, no washer or dryer. What a hard life it was. She was a remarkable woman. She and Samuel Wesley were married on 11 November 1688. Samuel was 26 and Susanna was 19. Susanna and Samuel Wesley had 19 children. Nine of her children died as infants. Four of the children who died were twins. A maid accidentally smothered one child. At her death, only eight of her children were still alive. Samuel Wesley spent time in jail twice due to his poor financial abilities, and the lack of money was a continual struggle for Susanna. Their house was burned down twice; during one of the fires, her son, John, nearly died and had to be rescued from the second story window. She was the primary source of her children’s education. After the second fire, Susanna was forced to place her children into different homes for nearly two years while the rectory was rebuilt. During this time, the Wesley children lived under the rules of the homes they lived in. Susanna was mortified that her children began to use improper speech and play more than study. Susanna was buried at Bunhill Fields in London. Thank you for this mini-biography of Susanna Wesley. She was, apparently, not only a caring, loving, mother and soldier for Christ for her offsprkng, but also a very intelligent woman. I reckon that there are few women born in the 17th century whose names are recognizable to all but a few. That Susanna Wesley is one such woman bears testimony to the lasting impact of her faith in thought and practice. Would that our nation become filled with Susanna Wesleys. I will say that every revelation guides your thought and action. you may not swallow it hook line and sink. However you can meditate on it to discover the best way you can apply it to accomplish your goal. I think the rules are worthy for a parent to train his children with especially in this age of growing moral decadence. I know that the only book necessary to raise godly children is the bible. My parents poured it into us and it changed their family. The children were the ones that started asking questions about why we didn’t do this that we saw in the bible? Our parents would say, “If it says it we’ll do it.” They didn’t act like they were perfect. Now all 9 of their children are grown up and the most important thing to all of them is following Jesus. What happened to ‘Christ’ in Christian? Why are you ‘xing’ Him out? One thing I know for sure, God is perfect and Holy and He does not agree that none should perish. The fruit of the womb is a gift from God, if parents fail to do their part, children shall surly perish. God cannot tell lie, He never fails with His Word. Parents are the ones failing, hence the reason our streets are flooded with all sorts of demons. Every rebellious person we meet on the street or in the office comes from a home. If the home has failed, there you have the end product. The question should be: what kind of children I have raced? Are they for The kingdom of God or the kingdom of satan? How dare you intend to enter eternity alone. It might be time to go back into our inner room and seek help for our love ones. May God grant us His mercy! Sussana Wesley is a role model for us parents in these last days. I think why her daughters had issues is because of their absentee father. A father plays a significant role in her daughter’s life, especially influencing who she finally marries. Their dad was very cruel to his daughters forcing them to marry people they did not want to mary. I am torn yes, she raised two amazing men of God but what about her other children? The cross exchanging for a crown. A legal night of seventy years. And found the earnest of her heaven. When I read the epitaph Charles had inscribed on his mothers tombstone, I do not get the impression, at all, that he considered his mother “legalistic”. On the contrary, his words attest to his mother a righteousness and faith any Christian would welcome on his, or her, tombstone.